After my laptop picked up a particularly virulent virus recently, it meant a good number of my documents were wiped from existence; amongst them was the first draft of this review. So feeling a little like Bill Murray in Groundhog Day (though if I were being more topical perhaps I should have said Jake Gyllenhaall in Source Code) I set to work as quick as I could and managed to remember 80% of what I wrote first time around, I just hope the extra 20% I made up is better than before, anyway enough with my cyber mishaps here is my second version. 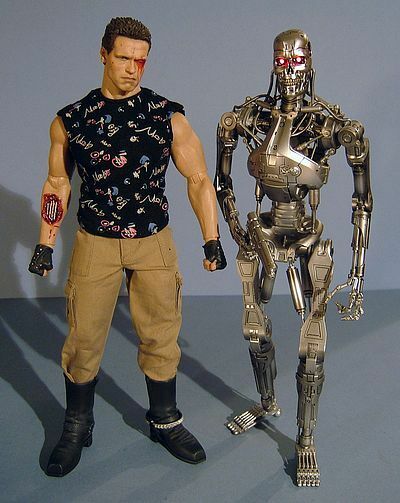 It seems like an eternity ago now, but was actually just a little over five and a half years previous that I reviewed the MMS 002 from Hot Toys, the Battle damaged T800 from The Terminator. 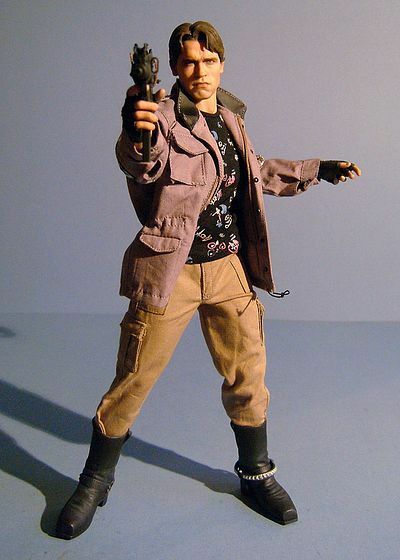 I then followed up with the MMS 001 of Kyle Reese, and it’s fair to say that with the next few releases from the company bought, reviewed and under my belt, I got pretty addicted to what became the regular Hot Toys ‘fix’! Fast forward to the present, and here we are with the MMS 136, and it’s time to revisit the original Terminator movie, and furthermore it’s plain to see, that even though those two original releases were impressive, they were also very much of their time when compared to the incredible portraits and paint apps that we get routinely from the company today! 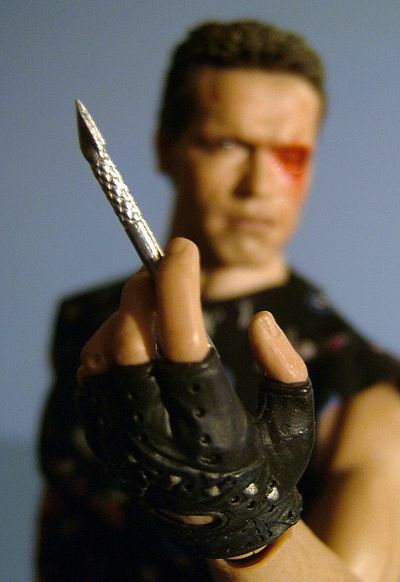 And the ‘two heads’ of the creative team, that have helped cement the position of the company, (namely Yulli Choi on sculpting duties and JC Hong on paint) have come together to give us ‘two heads’ on the definitive version of ‘THE’ Terminator (at this point in time at least… please do a DX for us HT!). I’ve already worn my heart on my sleeve with my love of the original Terminator movie over the inferior sequels that followed, I freely admit that T2 was by far and away the best of these by a wide country mile, but the original still stands head and shoulders above what followed. Not always in terms of production values, and certainly not in terms of wardrobe and woeful 80’s hairstyling, but as an original, well conceived, independently produced work of art that helped set the die for what modern action movies are today! So when viewed in this light The Terminator is important with a capitol ‘I’, and it don’t hurt none that it was also solid gold cinematic entertainment as well. It was amongst the movies that helped put Arnie on the road to super stardom and eventual political office (OK, I guess it had some downsides). But it was the perfect vehicle for his particular set of talents, as it showed him playing the Terminator as just that… ‘The Terminator’! In the original he was not some reformatted and reprogrammed quasi-father figure and surrogate protector. Oh no, here he was an emotionless, ruthless killing machine, and it has to be said that Mr Schwarzenegger found his absolute perfect role in this movie, he was born to play the T800, and he excelled. He didn’t over play it and he certainly didn’t underplay it. In fact James Cameron managed to coax out of Arnie his best and most memorable celluloid performance ever… You may disagree, but you’d be wrong! So yet again I’ve spelt out that this is my favourite movie that both Arnie and Cameron have made, both independently and together, so what am I gonna make of 1/6th version? I already said I wasn’t that impressed with the T2 boxes, and this doesn’t truly excite me either. However it has a few extra details and flourishes that make it a more interesting design, to my mind anyway. 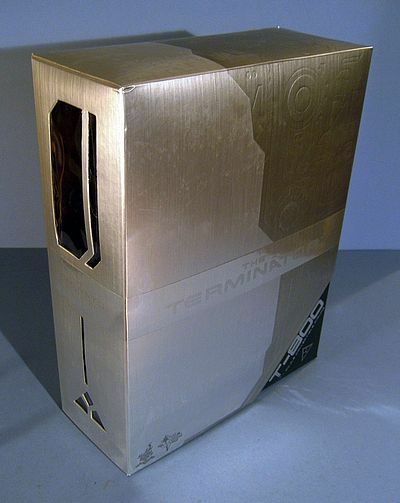 The outer sleeve, like the T2 boxes has a closed top/lid, but there is no duotone photography here, instead we have an embossed abstract design mimicking elements of the Endoskeletons mechanical body, shown in relief out of a metallic steel back ground. The metallic colour is made out of three finishes, a darker steel tone, from which the mechanical embossing is shown, then a secondary lighter brushed steel, and lastly a super glossy band of polished steel running around the middle, out of which the movie logo is shown. The side has die-cut windows through which you can see pics of the figure on the side of the darker inner box. This inner box has a large window on the front displaying the figure alongside all his accessories. The back has another photo of the figure alongside a full list of production credits. Hot Toys is building an ever more respected stable of creative talent, totally across the board, not just sculpting and paint apps, but in terms of tailoring, accessory design and graphic design as well. I guess it’s fair to say that Howard Chan is da man when it comes to having the eye for up and coming talent, and he obviously wants to make every aspect of the Hot Toys ‘experience’ as outstanding and memorable as possible. However, the two biggies that you HAVE to get right when it comes to the ever improving arena of 1/6th is always going be the sculpting and paint apps! And the two heads of the relevant departments at Hot Toys are Yulli Choi and JC Hong, (would the word legend be too big for the dynamic duo? Well maybe to the uninitiated, but for the collecting fan geeks out there it may be considered a gross understatement, as between them they have revolutionised the quality of the product we now get from hi-end manufacturers, elevating it to almost beyond recognition of what we were used to receiving a mere five or six years ago. And on this occasion the two heads of departments don’t just deliver one outstanding character head in the package but two… yes two head portraits from Yulli… oh happy day! 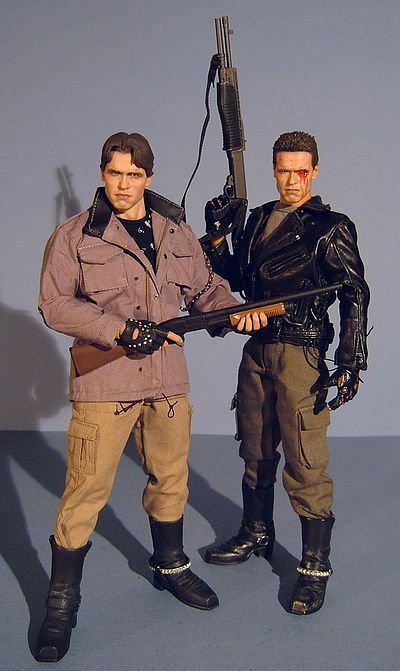 The work she did on the sculpt for the T2 figure was so outstanding that I feared this version would struggle to live up to the standard it had set, but I worried unduly, as this is a spot on likeness and shows Arnie as a slightly younger and chunkier man than he was by the time T2 came around! Looking at the two sculpts we get here side by side it became instantly apparent that from the ears and nose down they share the exact same sculpt, but Yulli has reworked the eyes, eyebrows (or lack of them) and hair on the damaged head to suit his unique injuries. Both are uncannily accurate, and show why Hot Toys are still so very revered in this market. The fine tuning on the skin texturing and the amazing detail captured in the way the two hair styles fall (with each individual hair picked out), is just mind boggling! The work on the damaged heads singed semi-mullet is nothing short of fantastic, but it’s the undamaged heads slightly droopy fringe that captures the classic look of Arnie in this role so, so perfectly for me. Basically this is up there with the very best 1/6th portraiture that Hot Toys have ever done, and is arguably a contender for that very top spot. 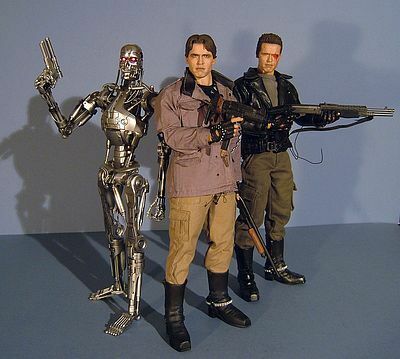 It is a mini work of art, that along with the T2 version makes them just about the strongest representations of the Terminator made commercially available at any scale, well, in my most humble opinion anyway! So far JC Hong has never let us down, and once again he just blows our socks off with another sublime paint app! The flesh tones are as always understated but still manage to look spookily life-like, but it’s those super glossy wet look eyes that truly bring the figure to life. On the damaged head the left eye is closed-up and slightly swollen, and is made all the more visceral by the clever use of the semi translucent glossy ‘blood’ paint, that streams down over the cheek. The hair on both is painted a flat matte brown, but this dull tone helps the light and shadow define the underlying details perfectly. All the hands bar the one for the damaged arm are wearing fingerless, studded leather gloves, and the division lines and individual studs are all picked out crisply and accurately. Another 4 star job all round! I sometimes think that literally every other company producing 1/6th (well, pretty much any scale really) must despair. Sure some other companies have licences that I’m sure Hot Toys would give their eye teeth for, but when it comes to the actual final quality of the product we get delivered, then in paint terms alone Hot Toys are in a league of their own! There’s is no denying than when it comes to iconic looks then the full bike leathers ensemble certainly gave the T800 a big boost of badassness in T2, but one could say that the look was also more than a little clich�d. B- Provide protection for his flesh covering. I am however mystified that his basic programming doesn’t make him search out clothing to help him blend in and disappear a little more in his location, OK, I might be taking things just a little too seriously, but hey, these are the kind of things that keep me awake at night! So ultimately I’m hugely impressed by the detailing here, things like the abstract patterns on the T-shirt and the size and shape of the links on the chain that hangs around his left arm are so well realised at this scale that once again he gets a home run in this category, it’s a no brainer! 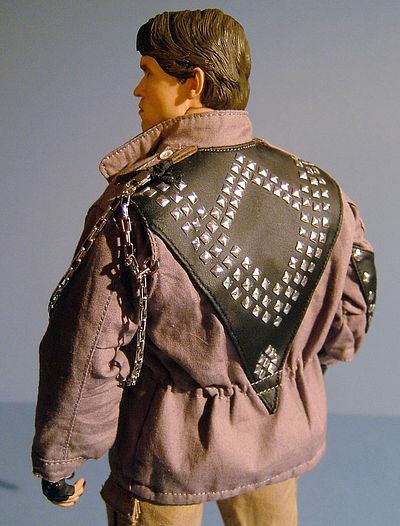 (I also want to emphasise that the pics of the T800 in the leather jacket are made using the first release of the battle damaged T800 seen here THEY ARE NOT included in this set). 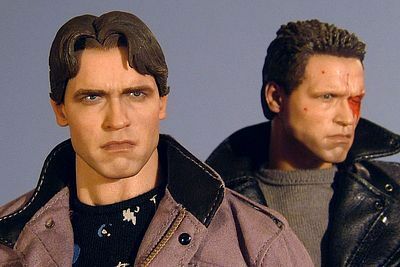 Like the figure of Arnie from T2 they have used the newly developed body specific to the physique of Mr Schwarzenegger. 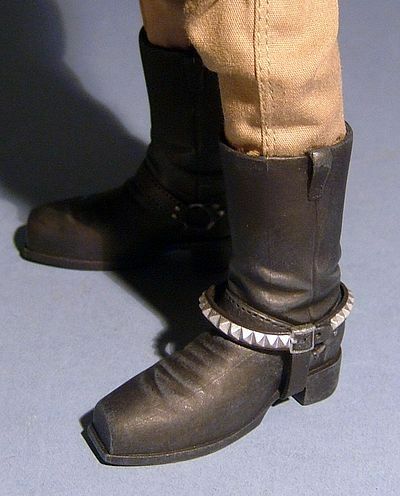 It’s a base bod that looks great even when the clothing is removed, but to get that impressive aesthetic, they had to lose some of the finer points of the articulation. 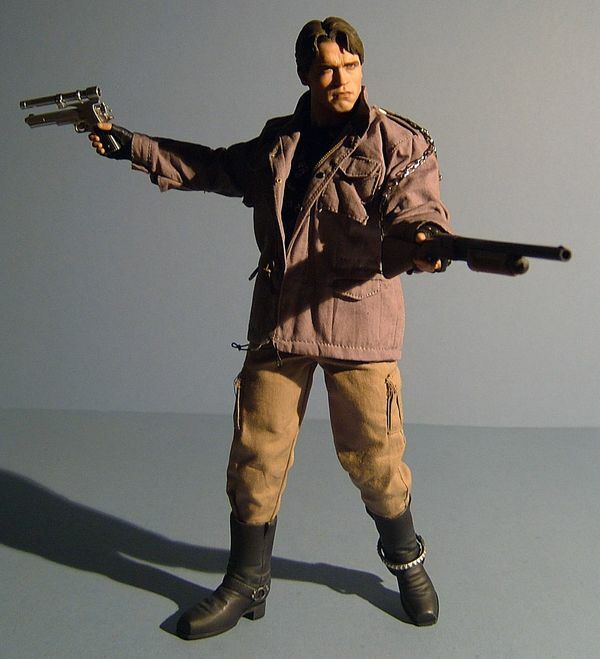 However you can still achieve a great range of poses, as you can see here from when I stripped off the T2, T800. It’s definitely worth reading over the instructions that come with the figure as they advise you on the posing and moving of the body. The neck, chest and abdomen are all painted rubber/silicone, so any abrasive rubbing could damage the outer coat. Don’t worry though, as with normal ‘respectful’ handling it’s more than up to standard posing, as it has a pretty robust paint finish, but remember to tilt the face up before turning the head as the inside of the chin could potentially scratch the paint on the neck. Apart from that it’s all good to go, and I’m more than happy with the range of poses I could achieve, however when compared to a regular True-Type (which for many of us is still the yardstick by which we measure a 1/6th figures full potential), then there is no denying this guy comes up a little short, but by god he does it with style and makes up for it by looking so darned good. 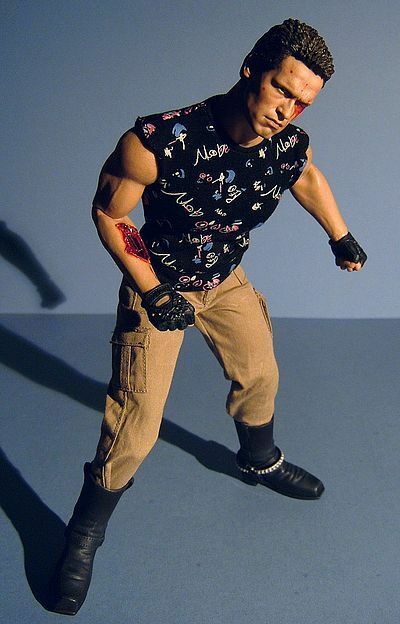 Like a lot of people I am praying we get a DX version of this guy further down the road. 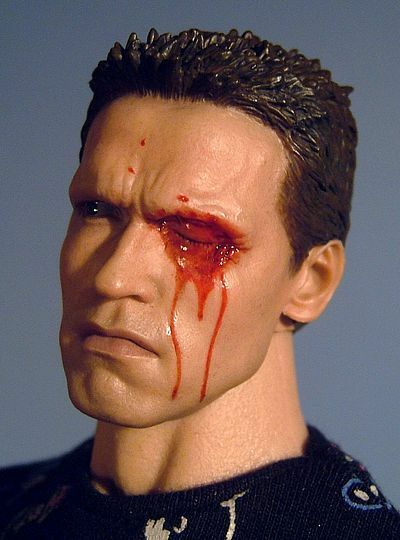 As a battle damaged T800 with the leather jacket, Gargoyle shades and a red light up eye feature would be fanbleedintastic! You can get a good look at all the weapons on the ever-reliable IMFDB here, and suffice to say all the weapons are well represented, well, apart from the AR-18 and SPAS-12 shotgun… yet more reason for that DX version! 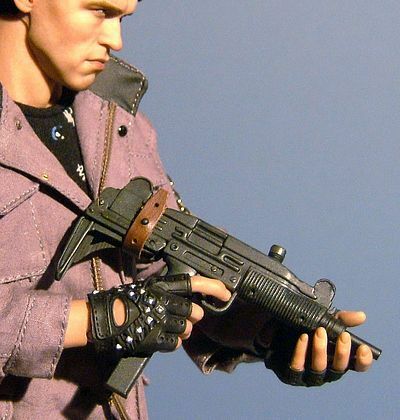 The guns have removable magazines, cocking mechanisms and ‘pump actions’ wherever applicable and the hands provided hold them well. 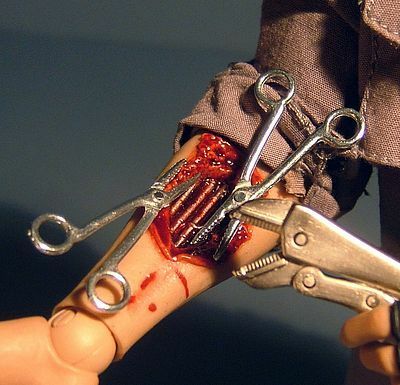 The medical tools are all made of metal and with some gentle coaxing and manipulation he can be posed well with them working on the battle damaged forearm, and apart from the scalpel they all have moving parts, with the pliers being the most detailed. The arm itself proved quite tricky to swap over, to the point of a light sweat breaking out. In the end I removed the hand first then dipped the whole arm in boiling water, after about a thirty second dunk I found it popped out a lot easier. I’m tempted to just leave the damaged arm in place, as when the jacket sleeve is rolled down you can’t see it, and when he carries out the field surgery in the movie, he carries it out with the jacket on and the sleeve rolled up. The detailing on the damaged arm is nice and gory with some finely observed detailing on the exposed servos and pistons, and the specific hand that is sculpted to accompany the arm is in a great pose for when the T800 is testing how his repair job has gone. The extra head was described in detail above, and it’s this addition that pushes the final score category so high here. 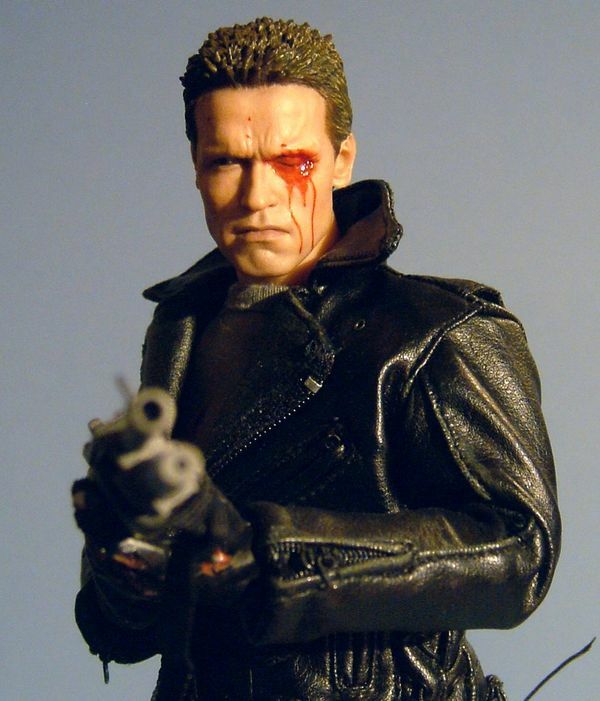 As it means that earlier T800 release can now have a fitting head attached to his shoulders, and the original head can become some random battle damaged T800 to stand in the background. We also get a great selection of hands to interact with his haul of goodies, all of which swapped over easily, so you should have no need for the extra wrist pegs included. Lastly there is the classic figure stand, but as always, unless absolutely necessary mine stay in the box, so this one is destined to life of darkness. Basically this is an outstanding collection of extras, helping to make this a pretty essential part of any self respecting Terminator fans collection. 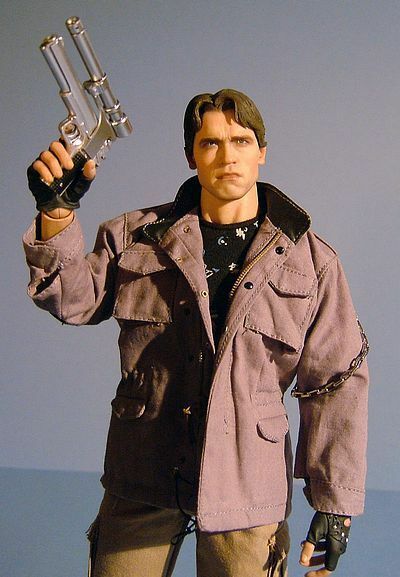 When it comes to Terminator movies I have never made it secret that I consider the original by far and away the best, so for me this has been something of a grail figure for a very long time. In the past there have been some exceptional bootlegs and fan made versions, and yes I have been tempted. However, the fact that Hot Toys finally got the green light to create my favourite version of Arnie ever, has made me a very happy geek indeed! The outstanding attention to detail on the costuming, accessories, specially developed body… not to mention the inclusion of two heads means this is for myself and countless others something of a dream release. And even though the articulation is a little limited it still represents the character near perfectly, and can assume pretty much all the signature poses you could wish for (OK, the naked crouch he arrives in might be a little tough, but what sick puppy wants that’s pose?). That was one of the few scenes where the Terminator arrival was actually more enjoyable in T3… guess it had to have some redeeming features. Of course, as we say till we are blue in the face, this is not one for kids, but neither was the movie! To people who have waited for an ‘official’ release of this figure, and who are aware of what kind of prices were being paid for good quality versions made by customisers, then the asking price here actually might seem like a gift from the gods. However, those people will most likely be in the minority. 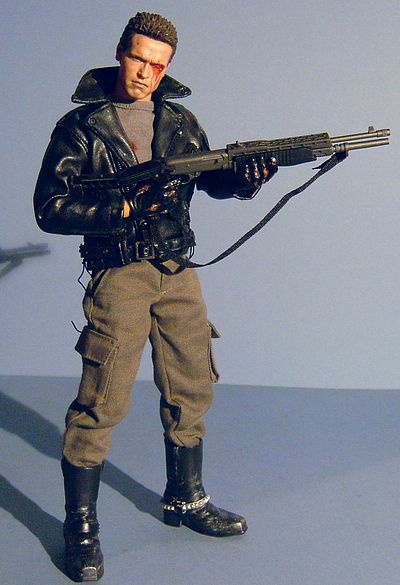 Lets face it, most sane adults will baulk when they see the price tag on a glorified GI Joe that asks them to part with nearly $200 of their hard earned cash. But those same folks would also be dumbfounded to see just how incredibly fast that same figure then went on to sell out on all the usual retail sites, and its price then start to skyrocket on the grey markets! For those of us in the know however it was obvious that this was one to get early and in multiples if you could afford it, as like the T2- T800 it is one of those instantly recognisable iconic figures, and it has the added bonus of a pair of portraits that are jaw droppingly good. So, though I can’t give it a full score, it still gets a lot closer than many other figures would in this price band. I guess what I said in fun factor kind of spills into this category as well. 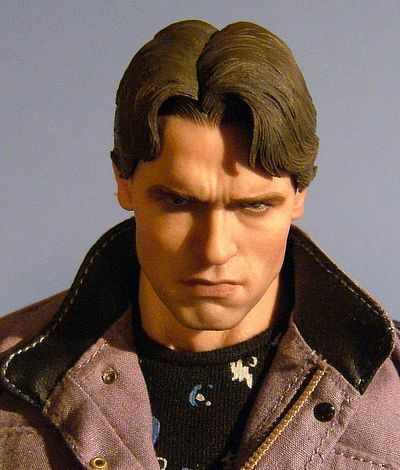 The overall package is virtually faultless, yeah, it ain’t cheap, but hi-end �ber detailed characters from top licences that depict top Hollywood stars never are. So, if you can beg, borrow… but stop short of stealing the money you need for this bad boy, then I’d say get him, and get him SOON… but by the time you read this it may already be too late! Sideshow sold out of this guy just about as fast as you’d expect, but the waitlist is always worth a punt. I did try looking it up on some of the sites sponspors, but its dryer out there than a wamp rats mouth in the midday suns, so your best bet is gonna be a trade fair or eBay, but on eBay this guy is already demanding between $250 to $300 a pop. 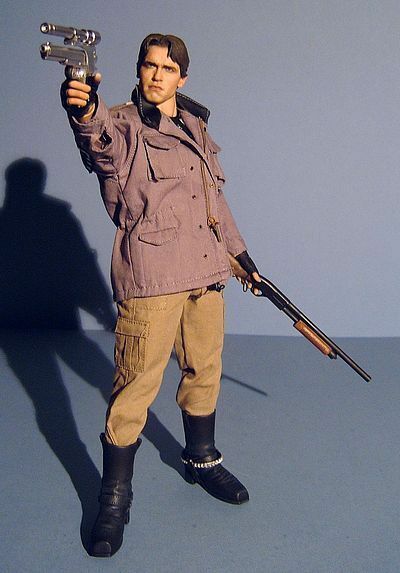 So lets hope Hot Toys come through and give us a DX or at least a second regular version of the police station shoot out.